Posted November 19, 2014, in Featured News, News, Student News, We R Arts and Sciences Student Spotlight. After graduating as the valedictorian from NYU’s Steinhardt School in May 2013, Rasheda received a Civic Engagement Graduate Fellowship from the Rutgers University-Camden Office of Civic Engagement. A passionate advocate for civic engagement, Rasheda was thrilled to be among the first cohort of Civic Engagement Graduate Fellows. “It’s a mission of mine to make sure civic engagement becomes part of the culture here. I want to be part of the change,” she says. Through the fellowship program, Rasheda has seen her work make a difference in people’s lives. Civic Engagement Graduate Fellows work with faculty members on designing civic-engaged learning syllabi, lecturing classes, and coordinating experiential learning activities for students. Rasheda has worked with a number of classes, including “Camden, Philadelphia, and the Region,” “Social Welfare Policies and Services I,” and “Organizational Behavior.” In Spring 2014, Rasheda worked with urban studies part-time lecturer Tom Knoche, whose Honors College seminar “Ecology: The Urban Science?” was a perfect model in meshing academic work with civic engagement. “Ecology: The Urban Sci ence?” focused on Cooper River Park West, an open space between Admiral Wilson Boulevard and the section of the river west of Route 130. For fourteen years, this area had been closed, with the official reason being that there were no funds to renovate the space. However, Delaware River Port Authority (DRPA) officials recently announced a $23 million plan to improve Cooper River Park East, which sits to the east of Route 130 in Pennsauken. Due to this inconsistency, a group called the Friends of Cooper River Park West organized, and began to advocate on behalf of their section of the park. Students in Mr. Knoche’s class were assigned a range of practical projects that would help this grassroots organization. Students prepared and administered surveys; tested both the water and soil quality; planned and organized a public birding event; reviewed and expanded information about the history surrounding the park; and helped Parkside residents develop a business plan that would facilitate residents’ use of the park and river. Rasheda mentored several students in the class on developing and administering the Survey of Community Attitudes and Utilization of Cooper River Park West, asking a total of 107 local residents and park users various questions about the park. Rasheda analyzed survey responses and found that participants who felt the park was poorly maintained tended to feel the park was unsafe and in need of security. The research also found community members desire features such as security, lighting, biking and walking trails, playgrounds, and picnic tables upon restoration of the park. Preliminary results were gathered and presented to a meeting of the DRPA where they subsequently announced they would transfer ownership of the park to the Camden County Municipal Utilities Authority (CCMUA), who aims to restore it. In October 2014, CCMUA announced it would work with the New Jersey Conservation Foundation to open and manage the park next spring. The New Jersey Conservation Foundation also agreed to implement Camden County’s Cooper River Gateway West Vision Plan, which was developed based on community desires and concerns uncovered in the survey. The work Rasheda did with “Ecology: The Urban Science?” students has helped restore one of Camden’s largest sources of green space, providing residents and visitors with a park and river to enjoy. The experience satisfied Rasheda’s hunger to help as many people as possible. “I love to see the students become passionate about helping people, and to influence their learning,” she says. Clearly dedicated to community development, Rasheda’s ultimate goal is to open up her own community-based service and research center, a project which she is well on her way to completing. Growing up in a poor neighborhood in the Bronx, she’s been committed to addressing the root problems of poverty, as opposed to only the symptoms, since she was sixteen. 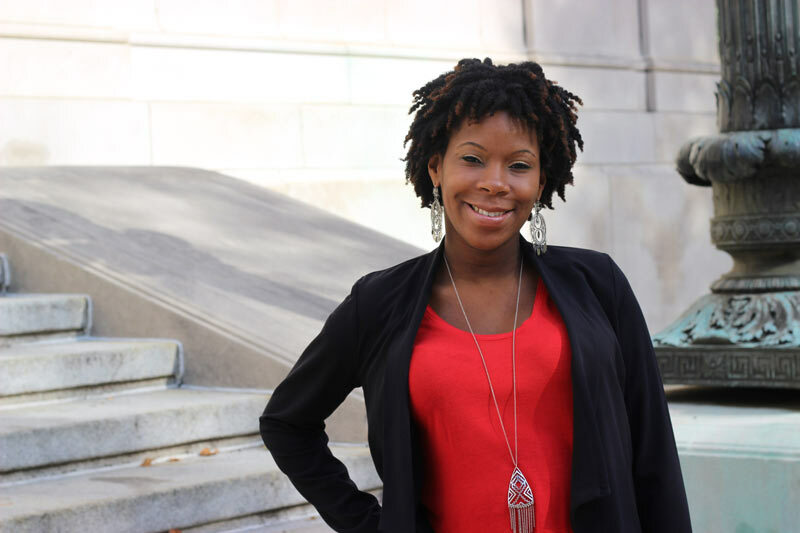 In March 2014, she founded the Dream Haven Community Research Center, Inc. (Dream Haven), whose purpose is “to provide services and generate research that promotes human capital development in Camden.” She’s currently in the middle of writing grant applications, with the hopes of gaining funding needed to help her form a staff and begin work that will benefit Camden residents. In particular, Rasheda hopes to connect Dream Haven with the work she’s doing as a Research Assistant for Dr. Shoko Kato, Assistant Professor of Strategic Management and Entrepreneurship for the School of Business–Camden. Rasheda and Dr. Kato are researching empirical applications of the capability approach to social justice and poverty alleviation, a project for which Rasheda brims with enthusiasm. In addition to being a Civic Engagement Graduate Fellow, a Research Assistant, and the Founder and Executive Director of Dream Haven, Rasheda also works as a Graduate Assistant for the Department of Public Policy and Administration with Dr. Stephen Danley, Assistant Professor of Public Policy and Administration. As a Graduate Assistant she authors the Camden Chatter series and conducts research on policy experimentation in urban communities. To top off her already impressive list of accomplishments, Rasheda recently received a “Commendation of Excellence” for her poster South Sudanese Asylum Seekers in Israel, which she presented in September at the National Society for Experiential Education conference in Baltimore, MD. For Rasheda, Rutgers University–Camden was her dream school, and Camden has become her dream city. A Camden homeowner, Rasheda is so inspired by the city in which she lives and learns that she plans to make Camden her home and place of work for the foreseeable future, even after she earns her Ph.D. For both Rutgers University-Camden and our home city of Camden, Rasheda is a true asset; we’re so glad she found us, and thrilled that she’s here to stay. This page was printed from http://fas.camden.rutgers.edu/2014/11/19/we-r-arts-and-sciences-rasheda-weaver/ at 7:06 AM Monday, April 22, 2019.